I write this with the full knowledge that I have not posted anything in a very long time. Really it is a testament to how well life has been treating me lately. That being said I have succumbed to a new hobby lately that I thought I would share with you. Bourbon delights me. Being diagnosed as a full blown diabetic can seriously impact your diet and your lifestyle. When you find out that beer and wine, two of my most beloved drinks are now off limits you have to improvise. That’s when, through much research and reading that bourbon whiskey has the lowest glycemic index of any of the primary spirits. Now you are probably thinking pure alcohols have no carbs and only trace amounts of sugar, well that is true, but of these bourbon has the lowest measurable impact on one’s blood sugars. Now, enough science for one day. When i decided to go on my own adventure in whiskey I was really in for a treat. I found a culture of friends and like minded individuals that has very much enriched my life. I have figured out I am not a fan of high rye whiskeys and that I AM a fan of high wheat whiskeys. Any whiskey or bourbon that is mildly sweet and tastes of fruit and nuts and isn’t too terribly hot or peppery is right down my alley. I always had what lots of my family called a varied pallet and this just brought it front and center. 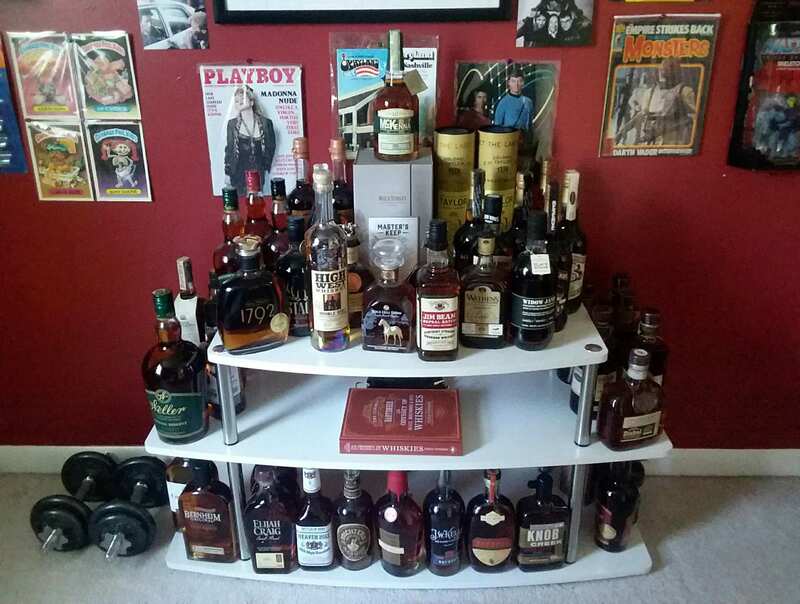 I now have a pretty substantial collection of bottles and I am always on the look out for anything that might taste good. I have glassware and tools for enjoying the dark water. Does my wife want to kill me? Most days yes, I think. Do I miss my stouts, porters, and marzens, you bet. Does the occasional wine bottle call out my name? Yes, yes it does. I have found a new love and her name is Bourbon.